This page highlights Artstor content related to western and non-western decorative arts, including a varied selection of images of furniture, interiors, tableware, textiles, ceramics, and silver. Image credit: Panel attributed to Thomas Moore. 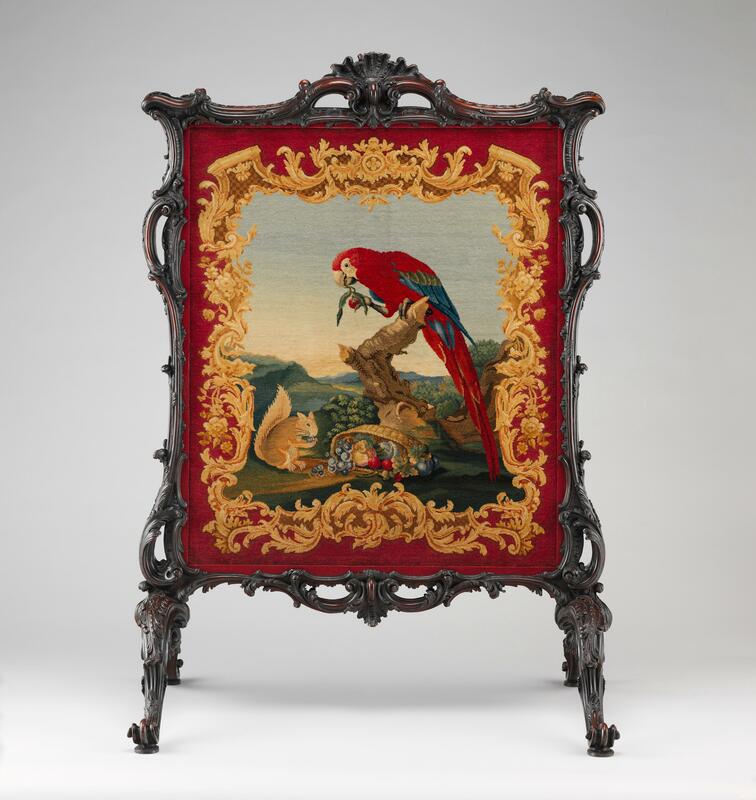 Cheval fire screen. ca 1755-60. Image courtesy the Metropolitan Museum of Art. Browse by classification for Decorative Arts, Utilitarian Objects and Interior Design and then narrow by country name. Browse museums with encyclopedic collections (e.g. The Metropolitan Museum of Art or The Museum of Fine Arts, Boston) and select the classification for Decorative Arts. Use the asterisk (*) when keyword searching to truncate your terms and retrieve variant endings (e.g. wood* will retrieve wood, wooden, and woodwork). The Museum of Modern Art has shared approximately 4,000 important examples of design objects and graphic design from the mid-19th through 20th centuries. International in scope, the MoMA Architecture and Design collection surveys major figures and movements and comprises thousands of individual items, including appliances, furniture, tableware, tools, textiles, posters, typography, etc. Although the collection’s existence and stature are well known, only five percent of the works in the collection have been published, and the majority of the objects are not on permanent exhibition. These works — many of which are three-dimensional and often quite large and/or fragile — are stored for curatorial and preservation reasons under conditions that render access extremely difficult for scholars and students. These objects have now been documented at high resolution using direct digital photography, allowing for the close study of objects that are not frequently on view in the museum’s galleries in Artstor.